Oh don't go down the cross stitch route, there lies madness and stash aquisition madness. Trust an expert. But I'm not, so I havent. Too late! I already know about it. My first time was for paper crafting stash, my second for yarn (and books and paper crafts). Who knows what will happen this year! The Birmingham one is in September if I remember correctly. Not all exhibitors here go over there, so if there's anything you want me to keep an eye out for you, let me know. The Dublin one is in November. I'd like if it was earlier, especially for Christmas card making. wellllllllll you could always come over for the weekend - or even the day! The show is literally a 10 minute walk from the airport and right this second Aer Lingus are selling tickets for a £5 each way for the 13th September. (plus taxes, natch). You wouldnt even need check in luggage! I thought you were claiming not to be an enabler? September is a really bad time for me to be buying stuff. We're going to be moving into a smaller place (once the house is done, we'll probably live in both places), so I'm trying to get rid of stuff now, not get more! Unfortunately, the acquisition has already started. I've bought a couple of magazine in the past, because the charts can be used for other things, have a book and some fabric from a friend, and bought two kits (unstarted). I have used one pattern in the book for beading, so at least it's not all unused. What will you do with the bits of cross stitch when you have made them? Unless you have a large contingent of elderly ladies, there are few enough people who really want cross stitched things. It depends what it is! It's surprising how many people will take things, no matter what their age, when they realise how much effort has been put into it. (The big shows like Twisted Thread show how much money is still spent on crafting such as Cross Stitching, and many of the people doing it are 40 and under). Many of my larger pieces have been framed up (or made into cushions) and are either hanging up in my place or have been given as presents to family members - I made one for my brother's wedding, one for my niece's birth, others for my cousin's 40th birthday etc etc. Smaller items are great for things like lavender sachets etc. - stuff that can be made up in hours and then given as presents. And then you can always sell on ebay or etsy. people will take things, no matter what their age, when they realise how much effort has been put into it. I agree. A lot of people do really appreciate that you have taken the time to make something for them. I like the idea of making commemorative pieces for landmark events. Do you put in details like names and dates? The only thing I dated was the wedding picture and that's cos there was space for it. It took me 4.5 months of pretty frantic stitching to do and as usual I hated it in the end. They are so detailed! Great work. My mum got a a cross stitch thing for Christmas the year we got married. It's a Native American wedding blessing. Good question. There are more contemporary patterns around, eg someone recently did a quote from Star Wars with a border or light sabres and blasters (does 1977 count as contemporary?). The one I'm doing now is far from modern though - a Victorian girl. It is small at least, so I think I'll mount it in a bookmark and maybe use it in a swap. I have two long abandoned pieces that I might pick up again if I find them. I'd give one of them to someone who I hope will appreciate the motif and the handmadeness of it, even if he doesn't want cross stitch. The other is poppies, which I like, so I'd probably keep that, even though I'm not that keen on cross stitched items either. I do find it annoying sometimes that I want to make things that I don't want to have. What to do with things is one of the reasons I mostly make cards. They at least have some purpose, rather than say decorating household items that I would rather have plain. I do find it annoying sometimes that I want to make things that I don't want to have. I hear you. It is sad to realise that the multi-coloured, cabled jumper is interesting to create, but that the end product is not actually useful, as no-one looks good in a multi-coloured, cabled garment. For me, it then becomes a question of whether my craft hobbies are, in loose terms, production or consumption. 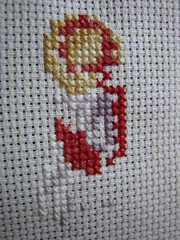 I think that cross stitch as a medium lends itself very well to modern motifs. I love the idea of the Star Wars piece! Charity knitting is a good one. If someone is freezing cold, a multi-coloured, cabled jumper is better than no jumper at all. But wouldn't the cold person be better served if I used the money that I spent on wool to buy them a set of thermals and a fleece? A lot of good solid socks could be bought for the money I spend on sock wool, for example. Giving away an ugly thing is just a way to make myself feel better about the consumption inherent in creating it! I'm sure they would. But then you'd have no money to spend on whatever hobby you did instead! And the same could be said for stuff you make yourself - you could buy a mass produced jumper (though maybe not as nice a one) and give the difference to charity. Or save it, spend it on something else, whatever. But you could think of the time and money being spent on something you enjoy doing that happens to end up with something you don't want and can give away, rather than thinking of it as the jumper costing time and money better spent on something more worthy. For example, for me, the teddies were a good way of practising some techniques and feeling pride in the finished objects. I could have given the orphanage money instead, but would I have? Honestly, the charity aspect served more as a knitting goal (wouldn't have made the teddies otherwise) and a way to feel good about myself than as a way to make their lives better. For all I know, it's money for food that they need. From an improve the world point of view, I think it also helps engender a feeling of connection. If the orphanage had an internet charity fundraise, I would be more likely to donate now than I would have been previously, because I feel a connection. There is a group that want hand knitted scarves for [American] orphans. Their reasoning is that these people probably never had somebody make something for them and would appreciate that more than a shop bought scarf. Whether they're right or not, I don't know, but it's perhaps something to think about.